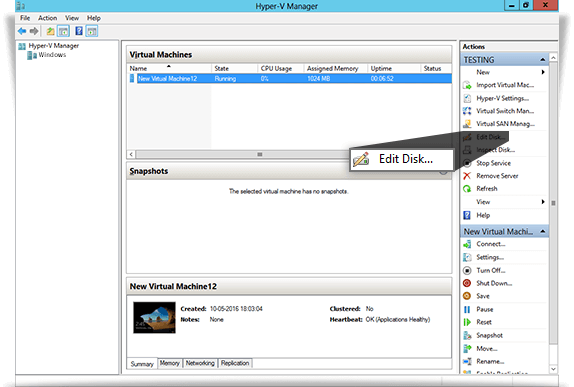 How can I backup my Hyper-V virtual machine(s)? What are the system requirements for IDrive Hyper-V Backup? Do I need to turn off or shutdown the Virtual machine(s) in Hyper-V manager to take a backup? 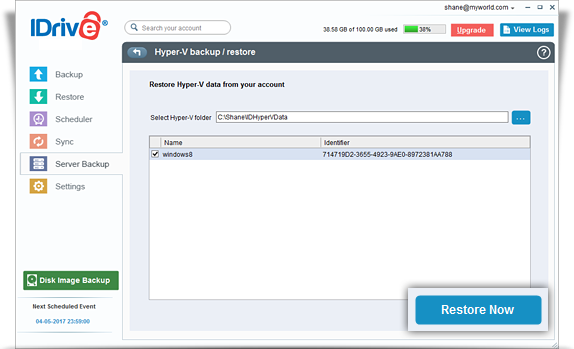 How secure is the data transfer during backup/restore using IDrive Hyper-V Backup? How do I restore virtual machine(s) to the Hyper-V Server? Is there a need for an additional/external storage volume for Hyper-V Virtual backup? 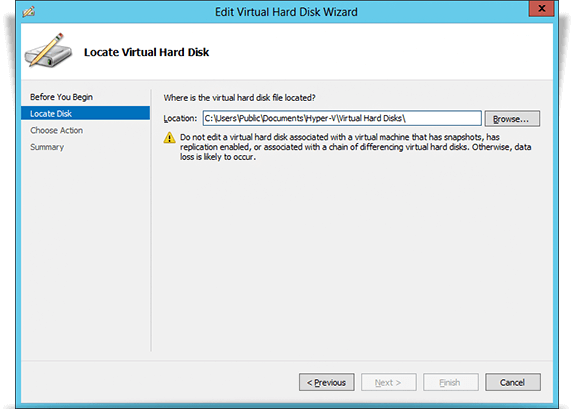 Can I attach a VHD file from IDrive Hyper-V Backup to a different Hyper-V server? 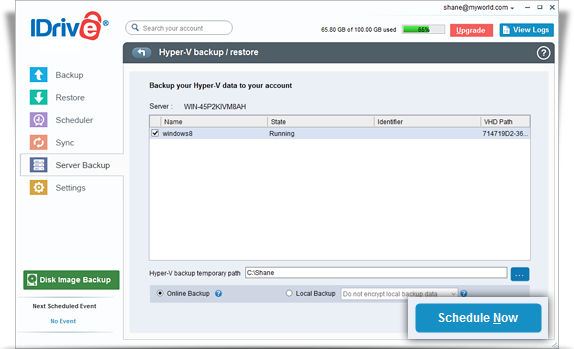 How to restore Hyper-V virtual machine backup to different servers? How do I merge the Snapshots (avhd/avhdx) to Parent Disk? In the Hyper-V Backup section, click 'Backup'. Select the 'Online Backup' or 'Local Backup' radio button. 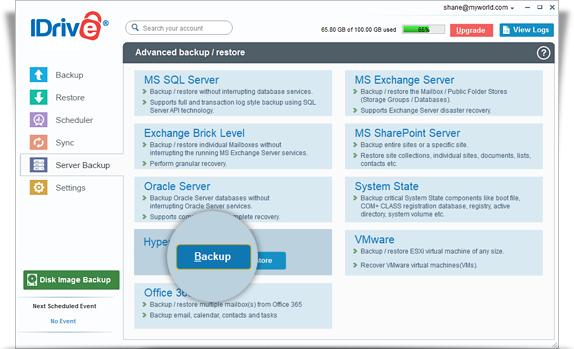 The 'Schedule backup' screen is displayed where you can schedule the backup for any future day and time or perform an immediate backup of the selected virtual machine(s). No. You do not have to shut down your active virtual machine(s) to perform a backup. 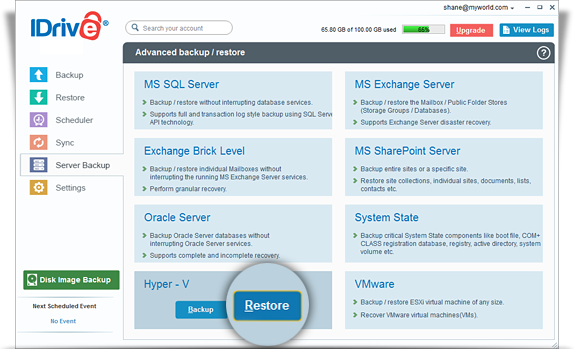 IDrive enables you to backup virtual machine(s) in their Running state. IDrive uses military grade 256-bit AES encryption to encrypt all data transferred during a backup/restore operation using IDrive Hyper-V Backup feature. Click 'Restore Now' to restore the 'IDHyperVBackup\IDHyperVData' folder to the local computer. In the Hyper-V section, click 'Restore'. Select the virtual machine(s) you want to restore to your Hyper-V server. Click 'Restore Now' to restore the virtual machine(s) to the Hyper-V server. No. However, do ensure that the temporary location that you select while scheduling the Hyper-V Backup has sufficient disk space to hold the selected items, during the backup process. 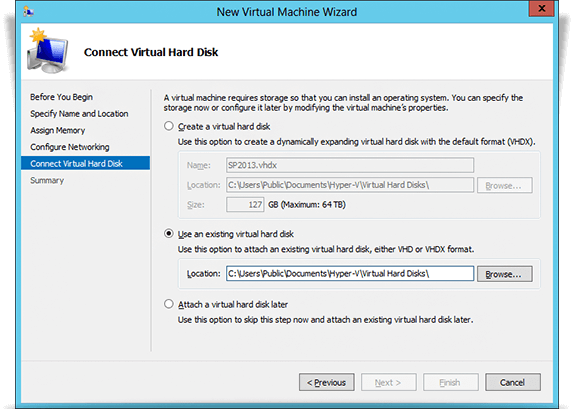 Yes, You can attach a VHD file from IDrive Hyper-V Backup to a different Hyper-V Server. 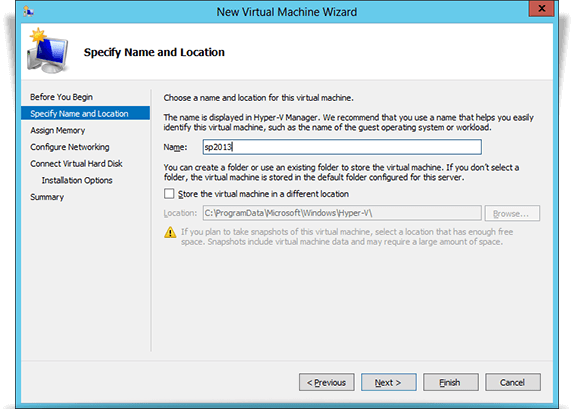 Create a virtual machine in the Hyper-V Manager. Go to the 'Specify Name and Location' tab, and specify the name for the virtual machine. Go to the 'Assign Memory' tab, to assign memory. Go to the 'Connect Virtual Hard Disk' tab and select Use an existing virtual hard disk radio button. Browse and select 'Vhd/vhdx' from IDrive Backup folder. Identify the newest AVHD in the IDrive Backup folder. Rename the newest AVHD (AVHD4) to VHD. Note: Do not rename all the AVHDs at the same time. Rename only the newest Avhd first. 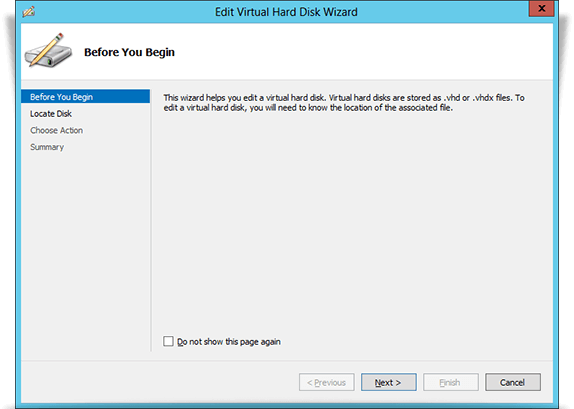 Choose the 'Edit Disk' option from the Actions menu in the Hyper-V Management Console. Click 'Next' through the first screen and select the snapshot file on the following screen. Select Merge on the next screen and choose 'To parent virtual disk'. After merging, AVHD4 will be deleted automatically. Rename the second newest Avhd (AVHD3) to Vhd. and Repeats all the steps until the oldest AVHD ( AVHD1) gets merged with the parent VHD.